The WI is calling on members to take action to make it as acceptable to talk about mental health as it is about physical health. Find out more below. At the NFWI Annual Meeting in June 2018, delegates were clear that action must be taken to improve the way we view mental health. The WI’s Make Time for Mental Health campaign aims to tackle the stigma associated with mental health problems and asks for better support for those who need it. It calls on WI members to recognise the importance of parity between mental and physical health and take action to make it is as acceptable to talk about mental health as it is about physical health. Time to Talk Day is an annual awareness day encouraging everyone to talk about mental health in order to remove the stigma around the topic. This year the day is themed around the ‘ingredients’ of a good conversation. Members can get involved by starting a conversation about mental health at their February meeting. To find out more and download bunting and a poster to display at meetings, please visit My WI. We have launched a postcard action to encourage healthcare professionals to ask people about their mental and physical health. This is based on research that suggests people with mental health needs often feel a lack of attention has been paid to their physical health, while others with physical health needs report the opposite effect. We know this won’t be possible in all instances as healthcare professionals work in pressured time slots. However, where feasible, simply asking someone "How is life?" can encourage them to start talking about their mental health. Our postcard is designed as a reminder of this. To find out how to take part, visit My WI. Download the Make Time for Mental Health action pack. 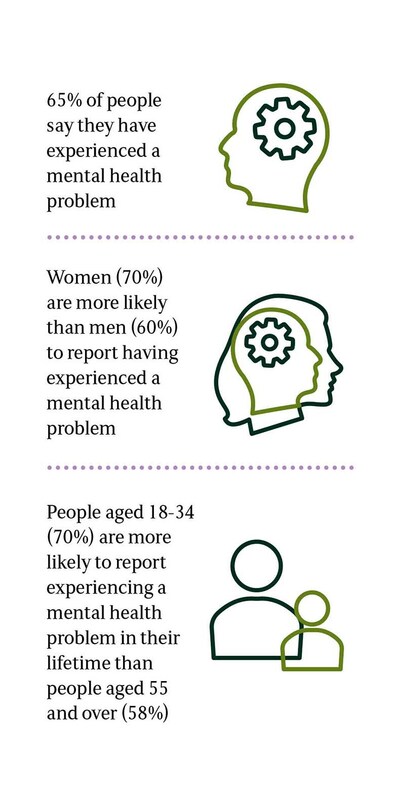 How common are mental health problems in the UK?